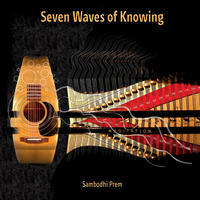 Sambodhi Prem : Seven Waves of Knowing. Reflections of the moon in music. Deeply meditative music that moves between silence and sound. Solo piano and solo guitar played from a space of inner reflection, like a wave of peace. The quality of water falling on a sun-shower-day translated into sound. Somehow music can filter through to places that are hidden from daylight. You feel music when your mind is open and the rhythm of your footsteps has slowed a little - when you stop and look at the empty space around you, listen to the silence between your words and look into the eyes of a person you love. Then without a warning a space enters you, you relax and for a moment there is unity - a reminding of a place you may have visited when you were young, full of wonder and innocence. "I like the open spaces in the music, the unhurried gentleness. Reminds me of staring into space, sometimes daydreaming, sometimes just staring at nothing. Very nice." "If you need to calm down or meditate this music is perfect. Piano solo pieces alternate with beautiful acoustic guitar. The sound is pure. This music is refreshing just as a glass of pure water or pure air in the mountains." "The most moving song on the album was the track, "Trusting the Universe." It was very touching and sweetly emotional. The guitar was deeply heartfelt on this album and the sounds were kept to a minimum, spare and yet so creative . . . as if the plan was that these tunes were to heal and soothe and comfort the tired and sore souls . . . well it worked! One of my other favorite songs was the sweet, slow and gentle traces of music from the guitar in the song, "Reflecting the Moon," which was so peaceful I felt as if I had relaxed under the white light of a magical moon . . . This album was so good that I couldn't stop playing it all evening . . . it was like sacred medicine to my soul . . . and I needed it . . . and I got it! License Reflections of the moon in music by Sambodhi Prem for your project. Play the music of Sambodhi Prem in your restaurant or store.